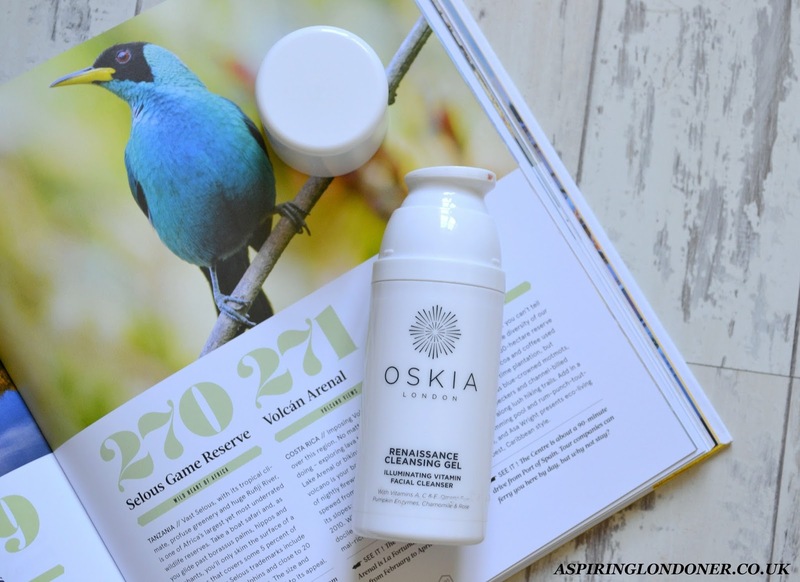 One of the most hyped up products - the Oskia Renaissance Cleansing Gel (£29.50) was a the most talked about cleanser by bloggers/youtubers in the last couple of years. When a product is talked about that much; I immediately think ‘they’ve been paid to say it’! I know, I know, how sceptical! But you can understand my scepticism especially with all the claims of lack of integrity. I digress. My curiosity did get the better of me, and I bought it last Spring. I’ve just cracked open my second bottle and I thought it was about time, I shared a review with you all. The Oskia Renaissance Cleansing Gel comes packaged in a large plastic bottle with a pump dispenser. This problem with the packaging has been well documented in the blogosphere - you can’t see how much you’ve used! It’s a pain as you never know when you’re gonna end up with no cleanser. I hope they resolve this soon. The gel itself is orange and smells a bit like like chocolate orange but in a nice way - not a sickly fragrance at all. I suppose the title gel is quite misleading as it’s not a foaming gel but a balm. It’s great at giving yourself a facial massage. I use it as a second cleanser so I couldn't vouch for its effectiveness in removing makeup. However I can tell you this product will be a regular in my skincare cupboard. Why? Because it’s the only cleanser that has visibly helped me with some awful acne/blemished skin. Last summer when I was travelling, I had the worst breakout I ever suffered. It lasted for weeks and nothing, nothing worked! Then I got back home from my first trip and used this and from the first use, I could visibly see my painful, awful breakouts were improving. I was actually amazed, I never expected it. Skincare products often promise many things and most don’t deliver to the claims. I feel like this has delivered and then some! I didn’t expect it help with my problem skin, yet it’s the only thing it did. So despite the bulky packaging, it goes with me everywhere now. I stopped using it after my skin had gotten back to normal and in the winter I started to see similar breakouts rearing their heads again. 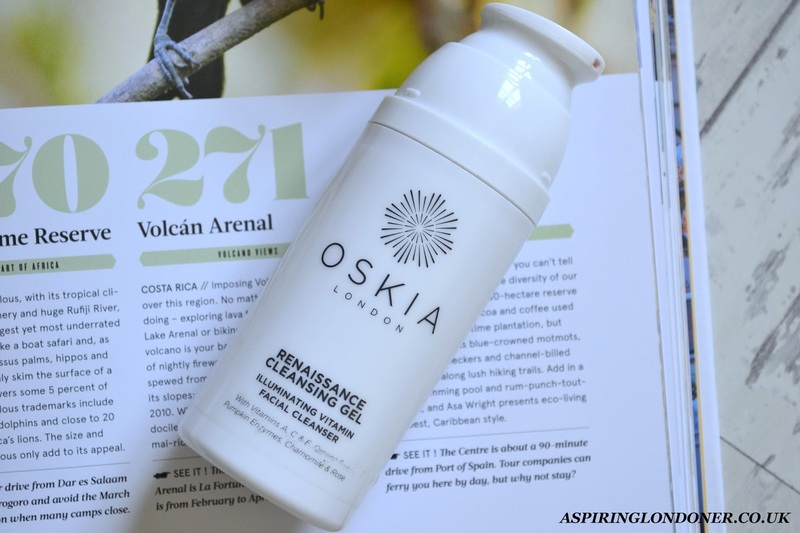 Straightaway I grabbed the Oskia Renaissance Cleansing Gel and it didn’t disappoint. It just works so perfectly for my skin, I just don’t see myself ever being without it! I use it as a second cleanser most nights and if my skin is particularly bad, I use it as my morning cleanser too. I take my time to massage it all over my face and sometimes take it down my neck too. I couldn’t praise the cleanser enough for how good it’s been for my skin! I’m on y second bottle and I have a third one in my cupboard. That should tell you how much of a lifesaver it is for me! I know the £28 price tag is hefty - but it has lasted me a long time and as a second cleanser I feel like it’s giving my skin benefit rather than being wasted on melting makeup. If you’ve tried it, let me know how you’ve found it. I know some people don’t rate it, but skincare is something so personal, that there is no real one size fits for all product. If you have similar skin to mine and the struggle with blemishes are a constant - I'd highly recommend trying out this Oskia Cleanser! What's the one cleanser you can't live without? Share recommendations in the comments below or tweet me @aspiring_london!